8Fun, also known as Bafang, is a Chinese maker of electric bike motors and complete drive systems. They have been distributing their products throughout China, Europe and the United States for over 10 years, now producing about a million motors annually. Additionally, they produce a full line of electric bike components for individual sale, from batteries and sensors to HMI screens, carrier racks and chargers, totaling 56 products. 8Fun’s line of drive systems includes front, rear and mid styles with motor power ranging from 250w up to 1000w, which are available in both geared and direct configurations. 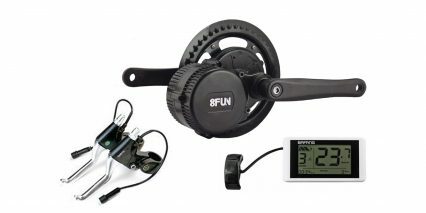 8Fun also makes drive systems and components for electric tricycles and kickboards. In 2012 8Fun opened an office in the Netherlands to better serve the European market.